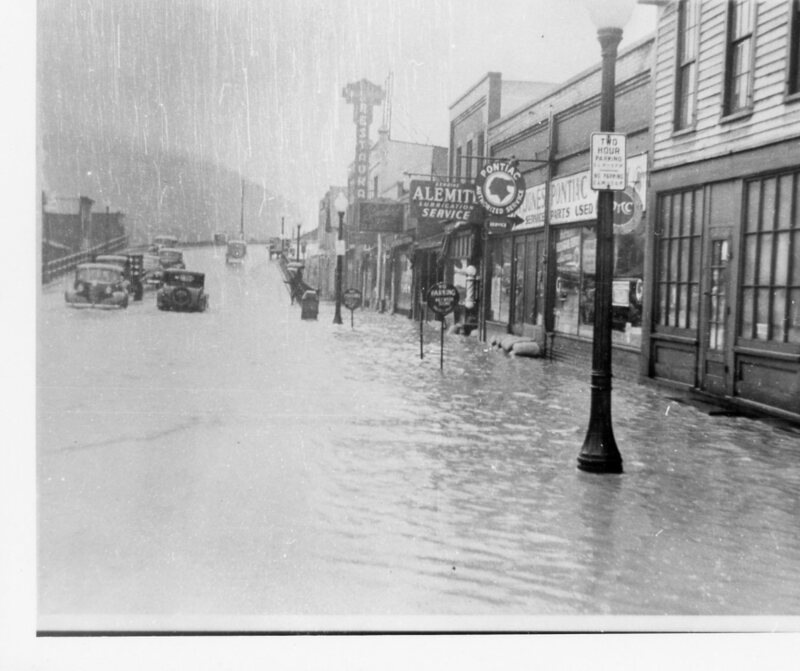 Our first photo for this week shows, what I believe to be either old Erie Avenue or Market Street during the Flood of 1935. Cool vintage cars are seen driving over the viaduct and you can clearly see stores signs for Jones Pontiac and Alemite Auto as well as a barber’s colorful barber’s pole. 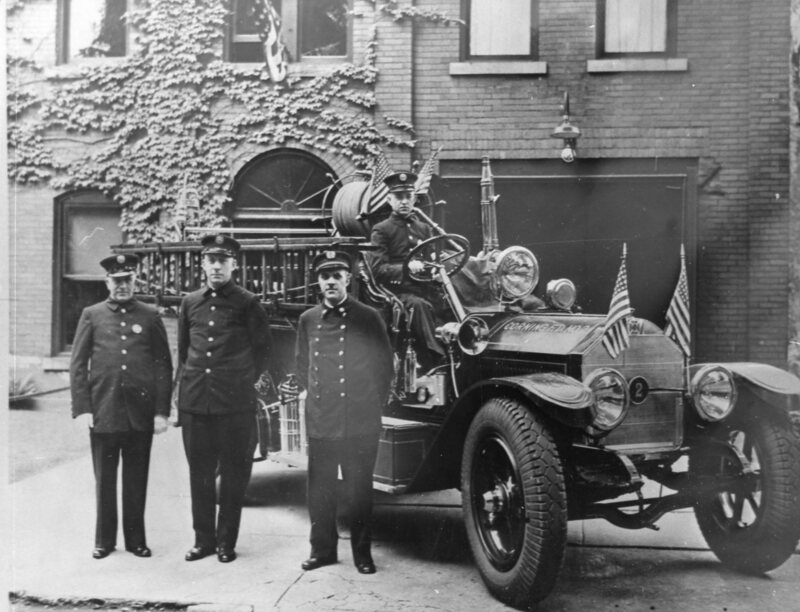 Our second photo for this week features a trio of fire fighter officials standing in front of a neat old fire truck. And, although our records don’t indicate where the photo was taken, I believe from other photos I’ve seen online that they are standing in front of what is today the Rockwell Museum! If you know anything about the three unidentified men in the photo please let us know! 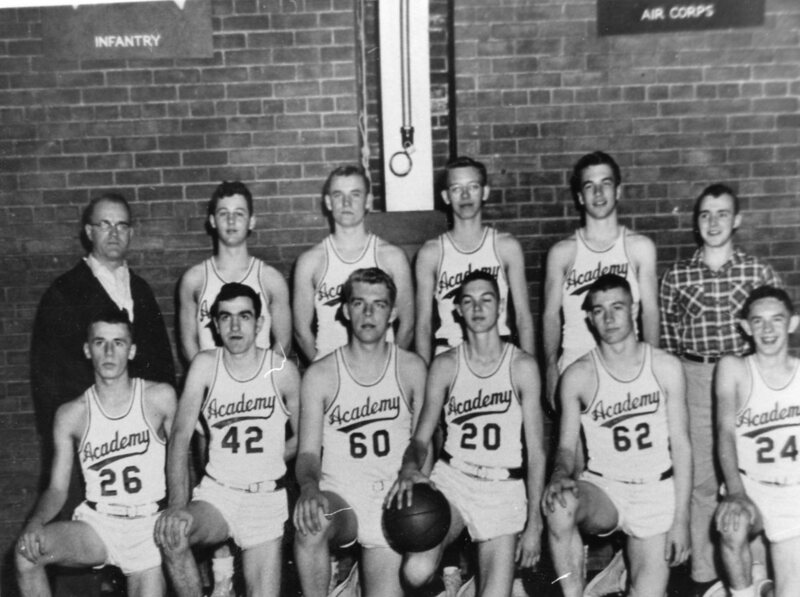 Our first photo for this week is of a Corning Free Academy Basketball Team in an unknown year. It would be neat to know who the young men in the photo are too! If your recognize any of the men in the photo and/or if you have any stories about local basketball players or games please share them! We don’t have a date or location for this photo. However, I suspect it may have been taken in the City of Corning at some time in the past as those hills in the background look familiar! 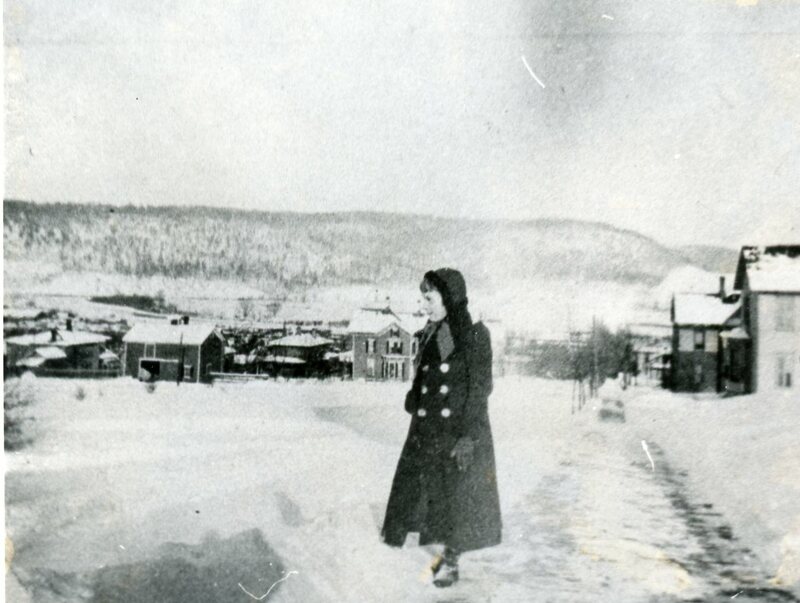 If you recognize where the photo was taken, who the girl is in the photo or if you have any stories of what life was like in Corning in ages past please feel free to share that information. 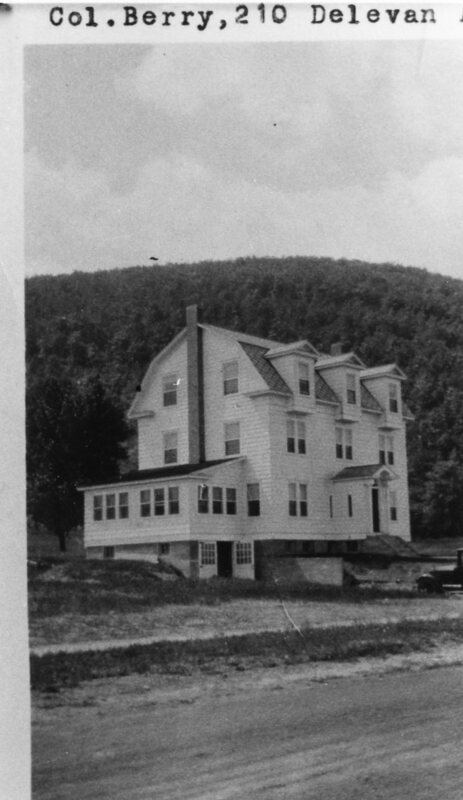 Our first photo for this week shows the old Colonel Berry house on Delevan Avenue in Corning. Our records don’t indicate who Colonel Berry was, so if you know, let us know! Our second photo for this week is another one of the photos of a photo that we have in our Local History Archive. You can indeed see part of two other photos at the top and bottom of this photo but it is a neat photo nevertheless. 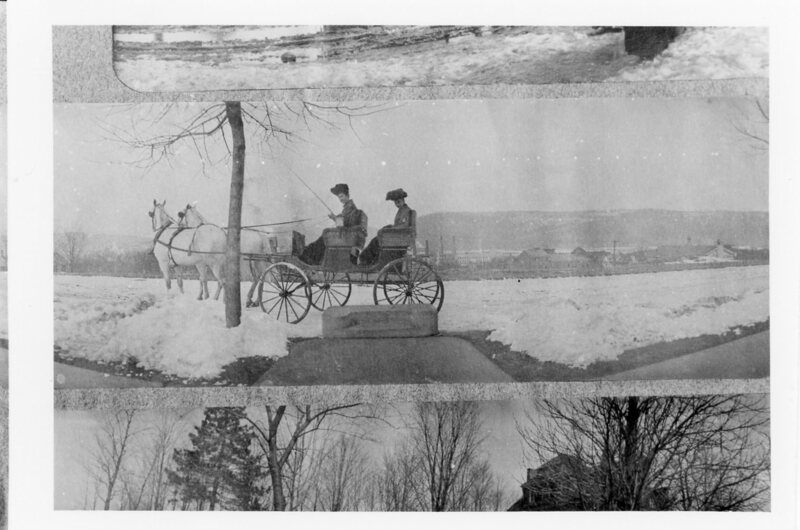 The photo shows a horse drawn carriage that appears to be driving through Canfield/Courthouse Park. I’m fairly certain the location is Courthouse Park, because if you look closely at the right edge of the photo you can see the edge of a large light brick building, which I believe is the courthouse. And to the left of the edge of the courthouse roof, between the edge of the roof and carriage, you can see the old Corning Glass factory buildings in the distance. Of course, our records don’t show who the two independent ladies are in the carriage, but the fact that they are on their own in an era that might just be before women gained the right to vote – is cool! All three photos for this week are of a parade that made its way down Market Street in 1948. You can tell the photos were taken in 1948 by looking both at the float that celebrates the 80th Anniversary of Corning Glass Works in 1948, and, by looking at the New York Telephone Company Float which lists how many telephones there were in Corning in 1948. 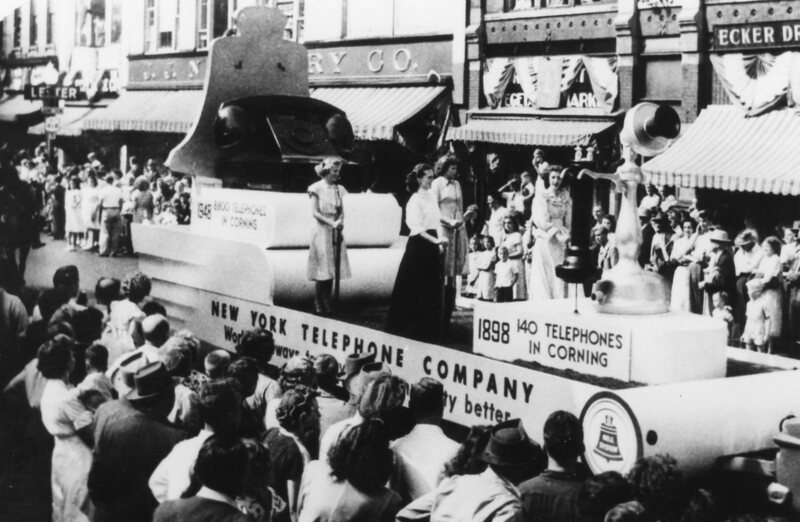 The New York Telephone Company float notes that there were 142 telephones in Corning in 1898 and that in 1948 there were more than 8,000! 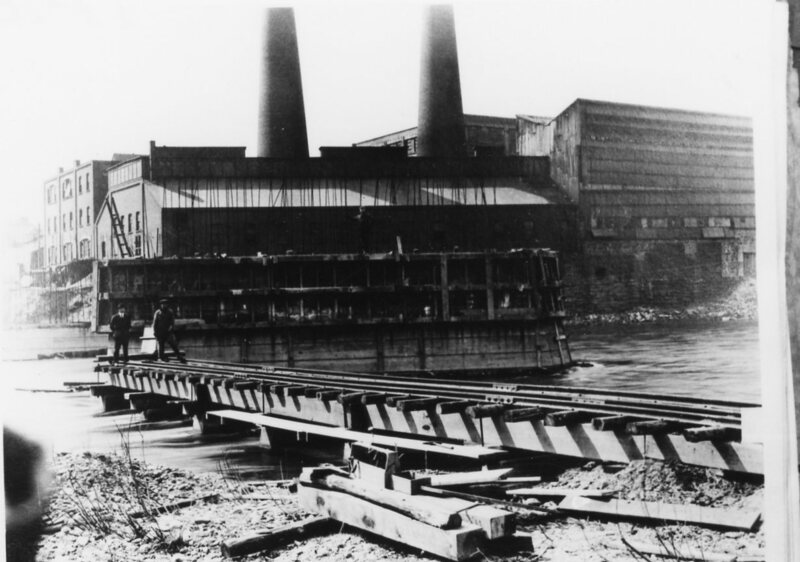 Corning has a long history of being a place that embraces new technologies! And you can see the old Newbury and the Ecker Drug stores in the background too! 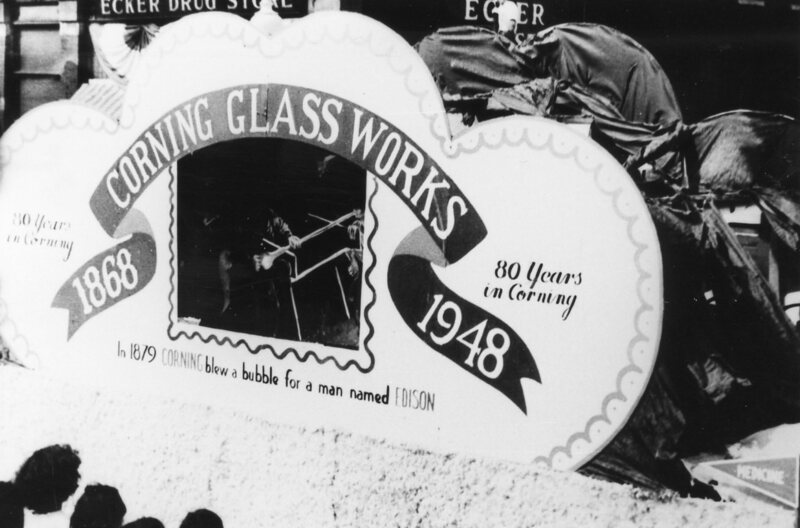 Our second photo for this week shows a Corning Glass Works Float that was created to celebrate the 80th anniversary of the Corning Glass Works – and that is super cool! “In 1879 CORNING blew a bubble for a man named Edison”, the text refers to the fact that Corning Glass Works made light bulbs early in the electric era and some were made for a man named Thomas Edison! And if you look very closely, you’ll see that there is a gaffer blowing glass in the middle of the float! 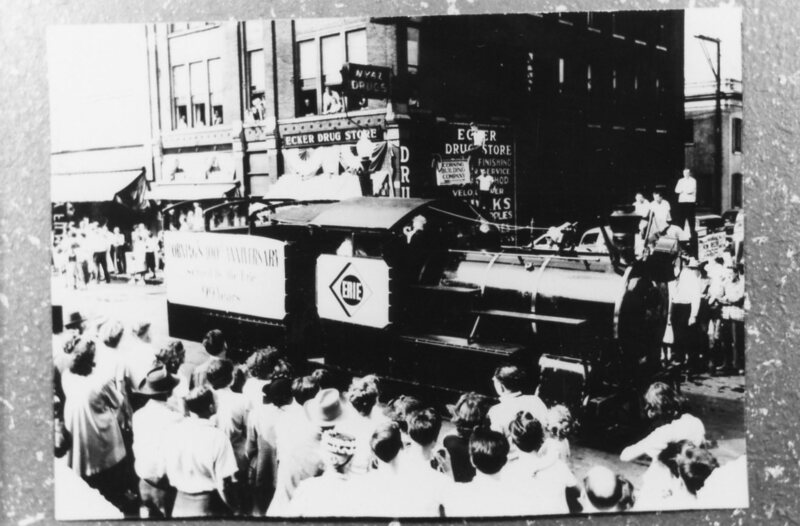 Our third photo for this week shows an Erie locomotive driving by the Ecker Drug Store as part of the same parade. We certainly don’t see trains running down Market Street or Erie Avenue (AKA Denison Parkway) anymore! 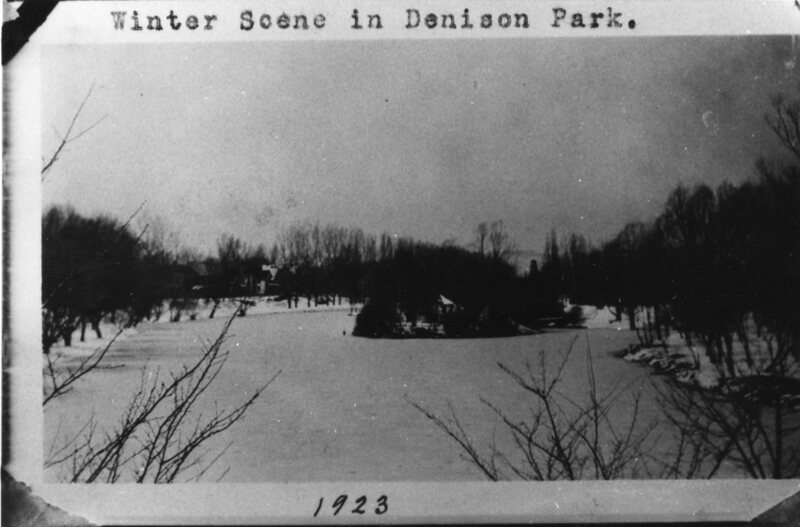 A frosty photo of Denison Park from 1923! 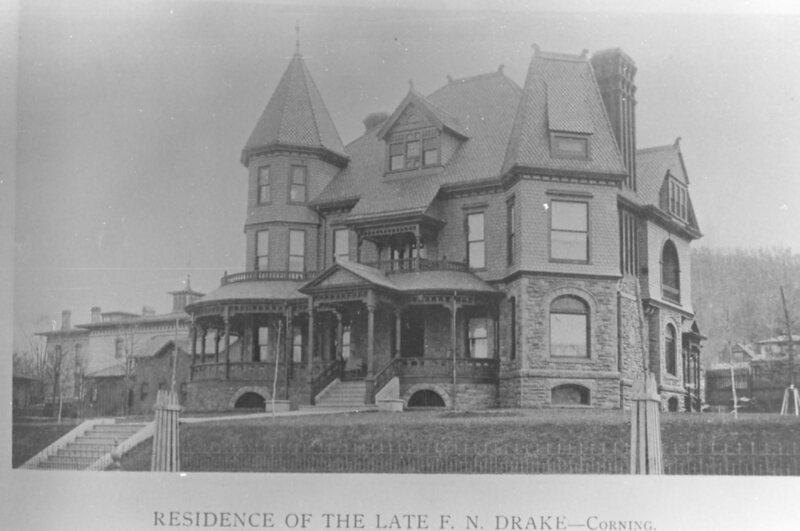 And old postcard showing the Drake House which I believe was located on East Second Street in Corning. 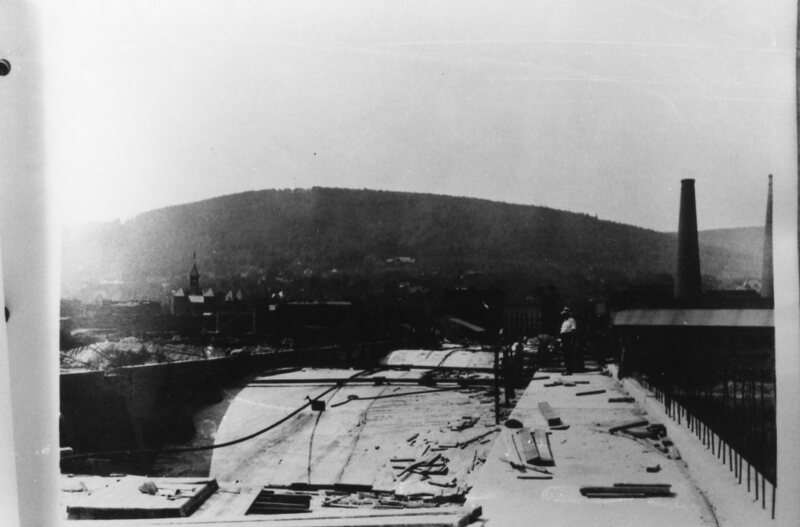 Photos 1 – 3 show the building of a bridge in Corning near the old Corning Glass Works factory. The bridge may be the Briscoe Bridge that was built in the early in the 20th Century. 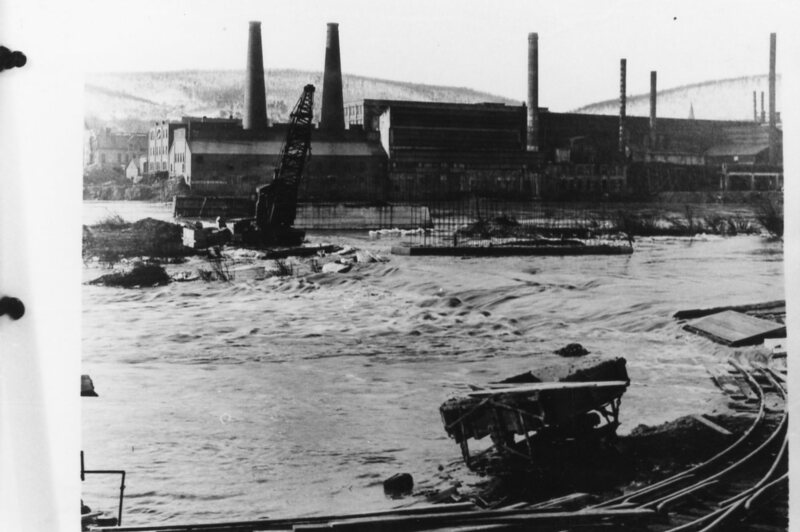 The Corning Glass Works factor was demolished, and today that location features the headquarters of Corning Incorporated. 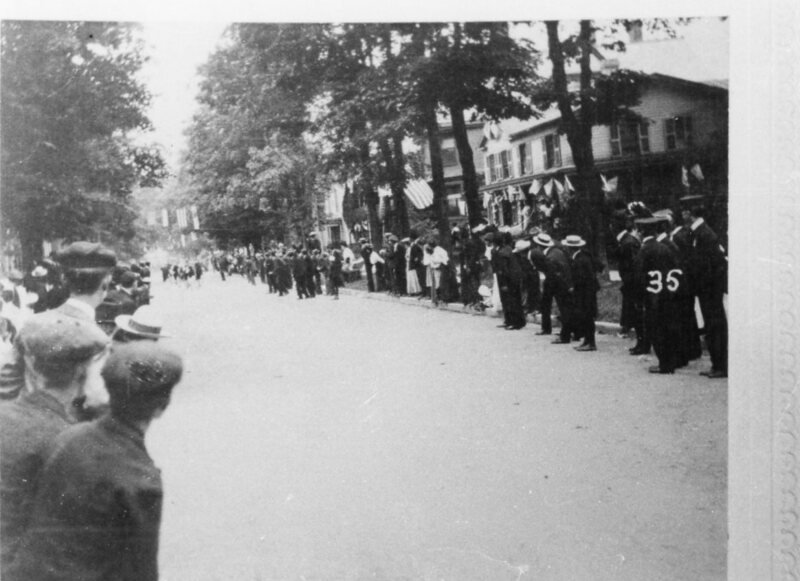 Our first photo for this week shows a parade in the City of Corning at some time in the past. And on a related side note, many of the photos in our Local History Archive don’t feature any information as to when or where exactly they were taken – and that is the case with this photo. In looking at the houses on right side of the street I believe this one was taken in the City of Corning, and it seems to have been taken before 1940 judging by the clothing the parade watchers are wearing. But you may know more than we do! If you recognize where the photo was taken please let us know! 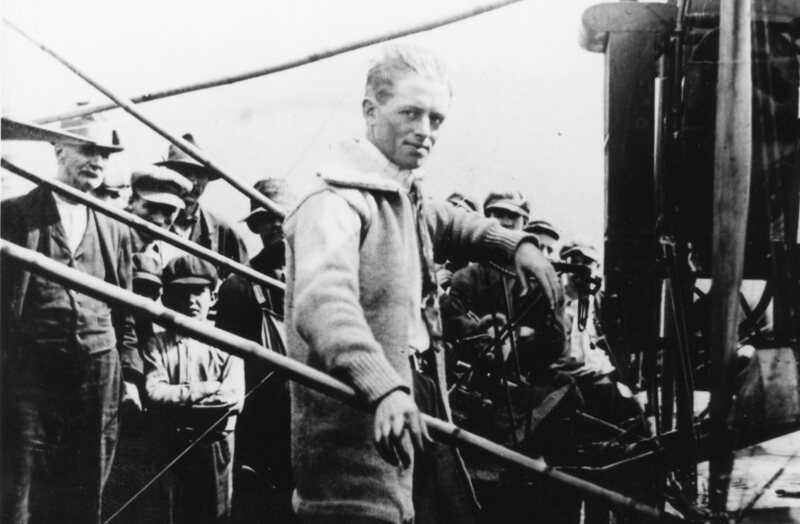 Our second photo for this week is again an undated photo. We don’t know exactly when or where it was taken or who the serious young man is at the forefront of the photo. The only thing we know for certain is it was taken in our area. Is that an airplane at the right edge of the photo or part of a train? If you know – please let us know!